There is no woman about whom the prophets prophesied, and about whom the Holy Bible cared, like the Virgin Mary.......There are numerous symbols about her in the Old Testament. In the New Testament also, there are her biography, her praise, and the miracles. How many are the glorifying expressions and the contemplations, which were cited about the Virgin in the books of the fathers.........How full of praise are the surnames by which the Church calls her, and which are inspired from the Spirit of the Holy Bible.......! She is the mother of all of us, the lady of all of us, the pride of our kind, the queen at the right side of the King, the Virgin with Perpetual virginity, the pure, the filled with grace, the saint Mary, the powerful and helpful compassionate mother, the mother of the Light, the mother of mercy and salvation, the true vine. This is the one whom the Church elevates over the rank of archangels, so that we say about her in her hymns and songs: O Mary, you have been raised above the cherubims, and have become higher than the seraphims, O Mary. fullness of the time would become complete by her (Gal.4:4)........... She has removed the shame of Eva, and saved the reputation of women after sin. Church, to be visited in past times by our Lady the Virgin! 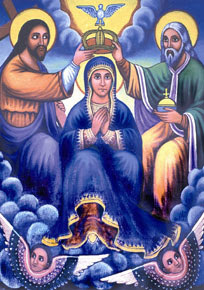 How great an honor is it that our Lady appeared on her domes many years ago! There is not a human being whom christians have loved so much as our Lady the Virgin Mary.